Raritan Valley Community College (RVCC) graduate Wendie Makoujy is the recipient of the Baker and Rannells Paralegal Studies Student Graduate Award. James F. Nielsen, Jr., Business Operations and Development Manager at Baker and Rannells, PA, presents the Baker and Rannells Paralegal Studies Student Graduate Award to RVCC graduate Wendie Makoujy of Frenchtown. Makoujy, a resident of Frenchtown, was presented with the honor at RVCC’s Academic Awards Ceremony, held May 14 at the College’s Branchburg Campus. 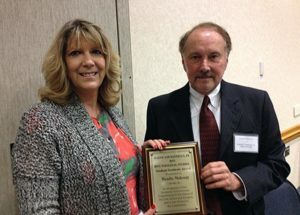 The award was established by Baker and Rannells, PA, a Raritan-based law firm that specializes in intellectual property, trademark and copyright law. The award honors an RVCC student graduating with an Associate of Applied Science or a Certificate in Paralegal Studies who has demonstrated not only academic excellence, but also a commitment to service combined with an ethic of justice, fairness and integrity, according to James F. Nielsen, Jr., the firm’s Business Operations and Development Manager. “The firm has hired a number of RVCC graduates from the Paralegal Studies program and has benefited from the good education that the College provides. The award is our way of thanking RVCC,” said Nielsen, who presented the $500 prize to Makoujy at the ceremony. After receiving a Bachelor’s Degree from Shippensburg University, Makoujy earned a Certificate from RVCC’s Paralegal Studies program with a GPA of 3.9 (out of a possible 4.0). While at RVCC, Makoujy reactivated the College’s Paralegal Club and served as club president for two semesters. She also was a member of the Phi Theta Kappa international honor society and participated in RVCC’s Student Government Association and the LEOS club for adult students. In the larger community, Makoujy has volunteered for such organizations as the New Jersey Statewide Guardianship Monitoring Program, the Tinicum Conservancy monthly road clean-up, and Habitat for Humanity (as part of the Morris County Ski Club). RVCC’s Paralegal Studies Certificate Program is designed for students who already have received, or are in the process of obtaining, an Associate Degree or a Baccalaureate Degree in a field of study other than paralegal studies. The 24-credit Certificate program allows students to obtain a paralegal education in a timely and cost-effective manner. It also helps students to meet the requirements of potential employers, a large number of whom require both a college degree and a paralegal certificate as hiring standards. RVCC’s Paralegal Studies program is approved by the American Bar Association and includes courses in all areas of the legal profession, with specialized courses in such areas as research and writing, litigation, real estate and family law. Faculty members are practicing attorneys or paralegals, each teaching in his or her area of expertise. For additional information about the program, contact RVCC’s Admissions office, 908-526-1200, or email admissions@raritanval.edu. RVCC’s main campus is located at 118 Lamington Road in Branchburg, NJ. Serving Somerset and Hunterdon County residents for over 40 years, the College offers more than 90 associate degrees and certificates. RVCC @ Bridgewater, located at 14 Vogt Drive, offers technical, trade, credit and non-credit courses. The College is committed to offering a quality and affordable education through effective teaching, liaisons with the community’s businesses and state-of-the-art technology. For further information, visit www.raritanval.edu.